As a homeowner, you face many potential problems. Fire, wind damage, floods and even earthquakes, tornadoes and hurricanes affect property in some parts of the United States. But one area many homeowners don’t consider is the problem of an oil tank leak. Depending on whether your oil tank is located inside or outside, the size of the leak and how long it’s been taking place, there is the potential not only for dramatic pollution problems, but some serious costs as well. What Is an Oil Tank Leak? Heating oil industry experts estimate about 6 million homes in the United States rely on oil heating, although many are switching from oil to natural gas, which we will discuss below. Residential gas tanks normally come in several sizes: 275, 290, 500 or 1,000 gallons. These oil tanks either live inside the home, outside above ground next to the home or are buried outside in the front or back yards with fuel lines that lead into the furnace. A leak in an above ground storage tank, or AST, makes itself known in several key ways. First, there is the odor. Even a small cap full of fuel oil has an extremely pungent odor. If you notice a strong oil smell in your home or outside near the tank, you should immediately visually inspect your oil tank and look for signs of oil leakage on the floor or ground. Leaks in outdoor, buried oil tanks provide a greater challenge to detect. Outdoor fuel tanks are made from steel that will react chemically with surrounding soil over the years, causing small pinhole-sized openings to develop. An outdoor fuel tank can be leaking for years without anyone knowing about it. Homeowners seldom notice their fuel bill may be rising a tiny bit, or when regular fuel delivery doesn’t seem to last quite as long as it did in the past. Only when these things become significantly noticeable will homeowners become concerned about a problem and suspect an oil tank is leaking. How Do You Know If Your Oil Tank Is Leaking? Your response to a leaking oil tank depends on the location of the tank. You'll need to handle an indoor leak using different methods than an outdoor leak. But once you've detected a leak, whether indoors or outdoors, you must deal with it immediately. It is relatively easy to detect an indoor oil tank leak. If you smell oil and you see it on the floor near or beneath the tank during a visual inspection, you know you have a leak. If your neighbor’s well or water supply becomes contaminated, there is an oil tank leak affecting the water table. If your home is the closest to your neighbor’s house, and their tank is OK, there is a good chance yours is leaking. If you begin construction on a swimming pool or an addition to your home, and the unearthed soil has a strong oil smell, there is a good chance you have an oil leak. If you have a sump pump in your home, you should check the water in the pump regularly for signs of oil contamination. Since oil is less dense than water, it will always flow to the top. Any heating oil in the water sample means, in all likelihood, your oil tank is leaking. As we noted above, what to do if an oil tank is leaking depends on the location of the tank. 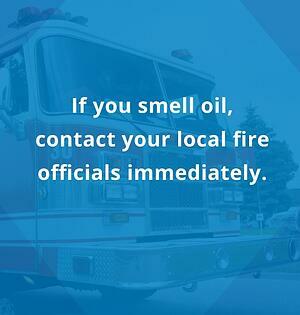 Notify the fire department: If you smell oil, contact your local fire officials immediately. Oil is combustible, and they need to know there is a potential fire problem. Ventilate the area: Immediately open your windows and set up fans to blow any odors outdoors. Close off the area to the leak: Until fire officials arrive, don’t let anyone near the leak. Protect your family: If the leak is large, possible health risks result from exposure to oil vapors, including headaches, dizziness, loss of coordination, euphoria, nausea and disorientation. These symptoms may even be worse with long-term exposure. Think about moving your family to a relative’s home or a hotel for a day or two while the cleanup is taking place. This advice is especially important if you have children or elderly relatives living in your home. Contact an oil cleanup contractor: You are going to need to repair your furnace, or even possibly replace it. This job is not a do-it-yourself activity. Professionals will know how to clean up the spill area, repair the tank if possible or advise you on a replacement if needed. Contact your insurance company: Many homeowner's policies will contain provisions for possible oil spills. You should check your policy as soon as possible, and if you have an old oil tank, think about adding protection against oil spills if it is not already in your policy. Outdoor leaks pose an infinitely more significant problem than indoor leaks. Repairing some outdoor leaks can cost as much as $15,000, depending on several factors. You need to be able to know if you have an outdoor leak, and then what to do with it. Take a soil sample. Contact an environmental expert to do a soil sample from the ground above and around your oil tank. It is probably the most reliable way to determine if an oil tank is leaking. Contact a state-certified tank removal contractor. You need a professional to do this job. Make sure you check with several contractors to get the best price, and ask for references from other people for whom they’ve done work. Remove the tank. This is the first thing the contractor will do. The process normally takes a few hours and makes a bit of a mess because they need to dig up your back or front yard. Unlike an indoor tank, it is impossible to repair any small leaks in a buried tank. The contractor must remove the tank. Notify the authorities. Once the contractor has removed the tank and verified the oil spill, they will contract the state authorities and report it. The state will then assign it a case number. Determine the extent of the oil leak. The next step is to determine if the oil tank leaked any fuel into the water table. In most cases, the contractor can determine this on the same day they remove the tank. If soil analysis shows the leak is above permissible limits, you need to determine how deeply the oil has permeated the soil by taking soil samples from below where your tank was located. Vertical and horizontal evaluations of the leak are required. Contact your insurance company. 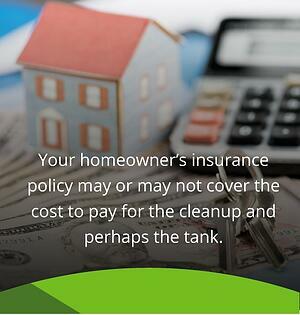 Your homeowner’s insurance policy may or may not cover the cost to pay for the cleanup and perhaps the tank. Normally, the insurance company will send out an adjuster to examine your property and review any documents and findings from the contractor. The insurance company will then arrange for the remaining cleanup. Finish the job. If there’s no damage to the water table, and your insurance company does not need to get involved, the contractor will revisit your home in a day or two with enough clean soil to fill the hole where the furnace used to be. They will then perform an onsite analysis of the soil to make sure it complies with the appropriate state standards. They will clean up any mess they have made, and your backyard should look relatively the same as it did before the oil tank was removed. File the paperwork. The contractor will then file a No Further Action letter with the state and give you a copy. You should store this with your home's other relevant documents. A senior environmental scientist once referred to leaking oil fuel tanks as “a suburban timebomb.” Why do fuel oil leaks provoke such harsh expectations? One reason for this outlook lies in the number of people who have used oil in the past, but are now converting their home heating systems to natural gas, solar or even wind. In almost all these cases, when people switch to an alternative for heating their homes, they leave old oil tanks in place, especially if they are buried underground. These buried tanks may remain intact for many years, but not forever. If the oil tank is not leaking now, you can feel assured it will one day. And if the homeowner who made the switch to an alternative heating source has neglected to remove any remaining oil from an underground tank, that oil will leak into the soil. And why do people leave oil fuel in an underground tank? The answer is almost always the cost of removal. When fuel oil is not powering a furnace, it turns into something more like a hazardous chemical, and needs a completely different method of handling. Abandoned underground oil tanks are truly a case of, “You can pay me now, or you can pay me later.” The failure to remove leftover oil fuel from an abandoned underground oil tank often results in much higher costs for people who could have removed it when they switched to another heating source. Remove the tank at the time of the conversion. Empty it, clean it and remove it. Call someone to cut it up and haul it away. The company that is helping provide you with, or setting you up with, your new source to provide heat will often offer a package deal. If you do business with them, the cost to remove the tank may be part of the deal. Fill ‘er up. Don’t remove the tank. Remove the remaining fuel, clean up the tank and fill it with sand or cement. Another problem with buried oil fuel tanks might be called the “out of sight, out of mind” problem. Then there’s the “I’m too old for this nonsense” problem. The two are often linked. A newly built home will have a new oil furnace. But if your home is 20, 30, 40 years old or even older when you purchase it, that oil fuel tank buried out in the backyard could be ancient. That leads us to another of the main reasons oil tanks leak — people leave them in the ground long past their “best-by” date. As we noted above, the steel in new tanks over time will react with the surrounding soil and eventually corrode. Unlike an indoor tank, which you see every time you go downstairs to do the laundry, people don’t think about their outdoor tanks because they don’t see them. A good rule to follow is to replace your oil tank whenever you replace your roof, which is normally every 10 to 20 years, depending on your warranty. Yes, it’s an added expense. But paying for the costs of an oil tank leak can be much greater. Can I Prevent Oil Tank Leaks? Whether or not you’ve ever had an oil fuel leak, you can take steps to prevent it from happening for the first time or keep it from happening again. Place all the fuel oil lines that run from the tank to the furnace under concrete, or put them in protective tubing. This step will help eliminate any accidental damage to your fuel lines. Make sure all the pipe connections are clean and tight. Another common reason for fuel oil spills is loose connections between sections of few oil pipes. Keep an eye on your fuel usage. It’s a good idea to monitor it and compare it to past years. If your oil fuel deliveries don’t seem to be lasting quite as long as they once did, it’s time to investigate. Regularly monitor the condition of the fuel tank and the lines. While it is certainly more difficult to monitor an underground oil fuel tank, you need to keep an eye on the age of the tank. If you know your tank is around 20 years old, it’s time to think about replacing it. Monitor ASTs regularly. You should check the stability of the legs to make sure they haven’t buckled after years of use. Also, check the ground or the flooring around your aboveground tank. Install spill and overfill devices on ASTs: These devices prevent spills and overflow when heating oil is delivered. They are easy to install, and an excellent way to ensure no heating oil leaches into the ground. Schedule regular maintenance. And by regular, we mean at least yearly — certainly before the start of any season that’s going to require you to heat your home. Maintenance is the best way you can prevent an oil spill or leak. Regular maintenance also helps your furnace operate at peak efficiency, which means you’ll get more heat for less money. If I Replace My Oil Fuel Tank, What Size Do I Need? If you’re replacing an oil fuel tank either because it’s developed a leak and is impossible to repair, your tank has gotten too old or your consumption habits have changed for your current needs, determining what size oil tank you need before you replace it is important. Location: The first thing you need to decide is if your tank is going to be inside or outside, above or below ground. Many people who remove older underground tanks replace them with indoor tanks. Family size: Older couples who are downsizing their homes may not need as big a furnace as they had in the past. But a newlywed couple on the verge of starting a family should consider not only what their needs are now, but what they will be in the future. Normally, one- to two-bedroom homes require a 275-gallon tank, but a three- to four-bedroom home needs something in the 300-to-500-gallon range. Consumption habits: If your family includes an environmental watchdog who is continually turning off lights in empty rooms and making sure the temperature remains consistent, your heating oil needs won't be as large as the family who likes to keep the house at a toasty 74 degrees through the winter and early spring. All joking aside, monitoring consumption habits is a reliable way to determine what size your new oil fuel tank needs to be. Being ready for anything winter throws at you: If you live in the Northeast or anywhere across the north of the country near the border with Canada, you know winter always has a few surprises up its sleeve each year. There's always the storm the forecasters missed that appears out of nowhere, leaves a foot and a half of snow on the ground and keeps you trapped in your home for two or three days. Err on the side of caution when thinking about your fuel consumption needs and give yourself a 15 to 20 percent cushion. At SmartTouch Energy, we consider it our job to take the hassle out of ordering heating oil for your home. Whether you’re contacting us in person or ordering fuel over the Internet, it’s important to receive both the best price and best service possible. Our prices can be as much as $0.40 below the Energy Information Administration’s average pricing. Once you schedule a delivery, it will be there in three days or less, and often on the day the fuel is ordered. You can check the prices we offer in your service area, then order the fuel you need online. Whether you’re ordering a one-time delivery, or you've set your home on automatic delivery, you can count on receiving great service. We even offer an emergency delivery service during weekdays for those times when you’re worried you don’t have enough heating oil left in your tank. We can also do regular maintenance on your furnace’s oil burner. Give us a call before winter starts, and we’ll make sure your furnace is ready for anything. You don’t want to find out it’s not working when the temperatures fall to the single digits and there’s snow up to the windows. If you’d like to know more about our heating oil delivery in the Northeast, or our oil burner maintenance service, call us at 855-385-7678 or send us an inquiry, and we’ll be in touch as soon as possible.